Those deep, dark eyes showcase your White German Shepherd’s fierce intelligence and can even get you to part with pieces of your own lunch or dinner – but what does your dog see during the daytime? 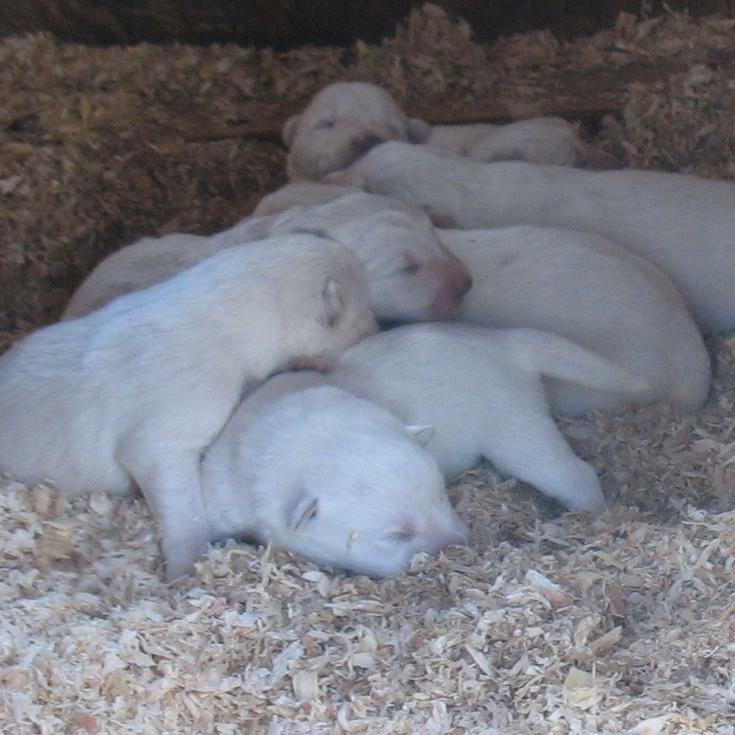 Differences in color perception, focus and depth perception give your White German Shepherd pup a few advantages over the rest of the family. How do German Shepherd Eyes Work? Your White German Shepherd’s eyes are relatively like your own; light passes through the pupil and lens, eventually casting images onto the retina, located at the very back of the eye. Your dog also has an extra eyelid – you may not even notice it; this nictating membrane ensures his vision field stays clear by eliminating dust and debris. He is closer to the ground than you, so more likely to stir up dust when he runs or walks. Without the membrane, that dust could lead to irritation and problems daily. According to veterinarian ophthalmologist Christopher Pirie, most dogs have what we would consider slight nearsightedness. Most pups have 20/75 vision; working dogs like German Shepherds could be even more nearsighted, since they rely on longer range vision to perform a wide range of jobs. Since your dog doesn’t need to see small items like text close up, you really won’t be able to tell he is nearsighted at all. Instead of relying on the kind of close vision to read a newspaper, your White German Shepherd instead focuses on movement and color. While your White German Shepherd is either a hard-working therapy dog, a protection dog or a beloved family pet, she is still a predator at heart. Her prey drive may never come into play, but she is equipped with the kind of vision designed to detect and track moving objects – prey. Animals with eyes that are on the front of the face can accurately track and follow moving objects; this detail is why your dog can snag a frisbee from the air or chase a ball thrown at a distance. What she gives up in near vision, her skill at detecting movement makes her a superior guardian and hunter. 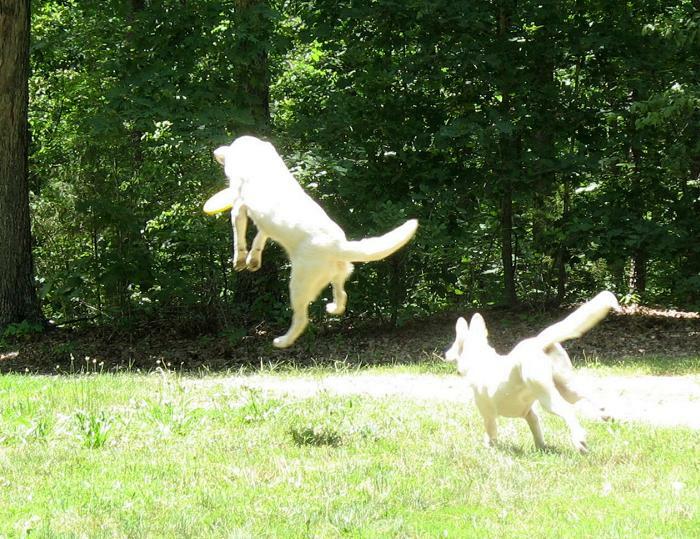 Are White German Shepherds Colorblind? A dog naturally has more of the light sensing rods in his eye than the color detecting cones; this leads to enhanced night vision (see our full piece on German Shepherds and night vision here) and slightly less color vision that the typical human. Your dog sees some colors, but not as many as you do, according to a piece in Psychology Today. Most dogs, including German Shepherds, see a range of cool blues, greens and greys – but not very many reds or oranges. 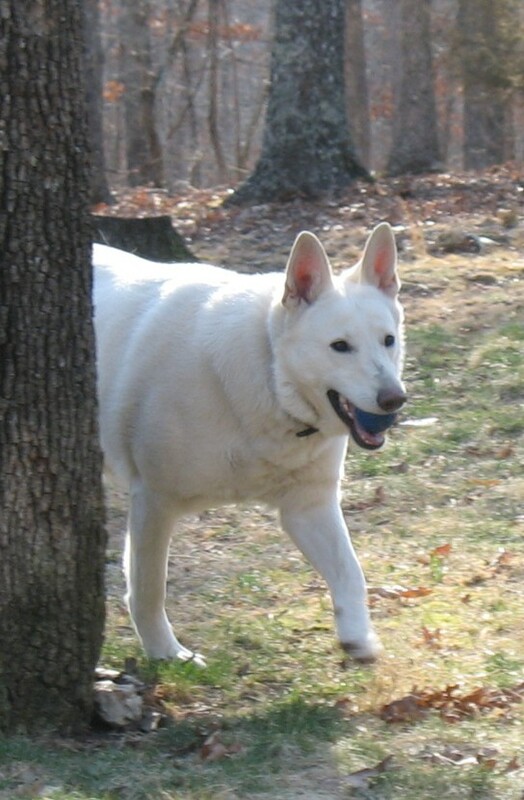 While motion may be the most vital component of day vision, both color and brightness matter to your White German Shepherd during the day. If your dog seems to ignore a red ball but goes crazy for a blue one – -there could be a reason. According to researchers at the Royal Society, dogs prefer color over brightness and may opt for items in their preferred color range over others. Dogs in a variety of studies responded more positively and consistently to preferred colors rather than increased brightness – so that bright yellow frisbee may be his favorite for a reason. 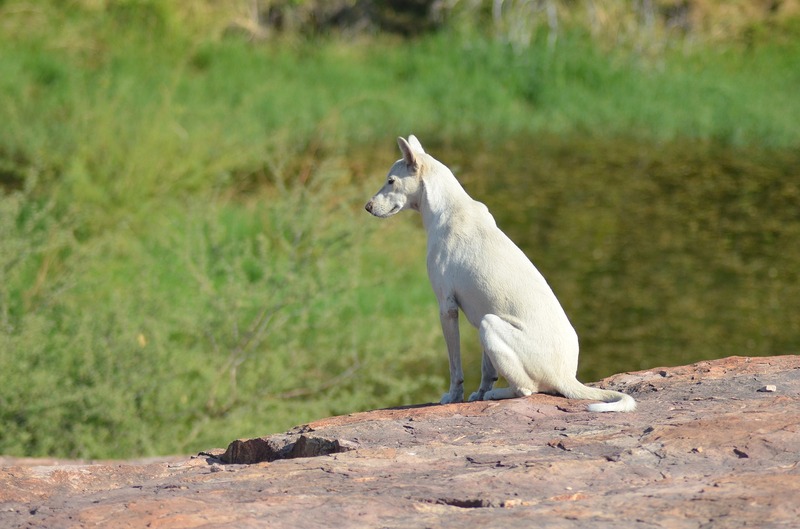 Your White German Shepherd’s vision has evolved to make him keenly observant of people and objects at a distance – so he may spot someone approaching far before you do. His lack of color perception doesn’t slow him down, and he may even have some preferred colors. Learning more about what your dog sees during the day and how he sees it can help you understand his behavior and actions and help you both when it comes to training and performance. Our latest litter is just beginning to open their eyes and focus on the world around them; stop by and see our newest puppies and watch as your pup’s vision evolves over the first year and beyond.